I haven’t always been a Dunk man, in fact, it’s a fairly new thing for me. There’s something about the lines of the Dunk Low that for me, seem to embody the true spirit of sneaker culture. This single silhouette holds so much history of legal battles, all night camp outs, mass hysteria, and astronomical price-tags, and every subsequent release has carried with it a little of that flavour. 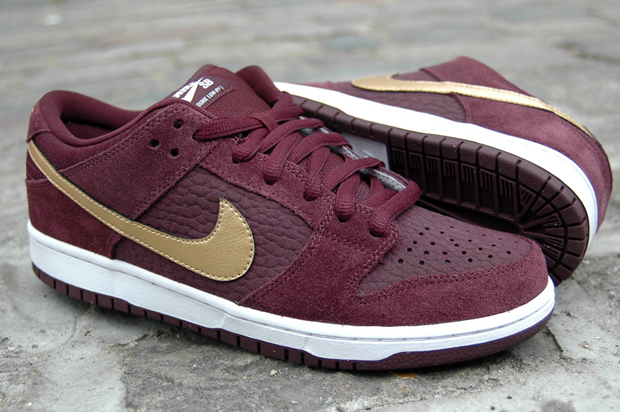 For July, Nike SB drop a brand new, burgundy and gold make-up for the Dunk Low Pro. The tonal ‘deep burgundy’ upper, compiled from plush suede and tumbled leather, is complimented with a metallic gold swoosh and that iconic white midsole. The burgundy-out continues on the outsole and heel, where you’ll find the NIKE letters embroidered in gold stitch, and inside the box you’ll find the trademark Nike SB lace roll, the alternate pair coming in white. Although most of this year’s Dunk Low releases have passed me by – excluding the Powers borrowing Bison/Varsity Purple effort – the above burgundy option is a much more likely purchase, and will no doubt do me, and other Dunk fans nicely to tide us over until the Space Jams, and maybe even a stab at the Entourages? Nike SB seems to have put a lot more energy into their Dunk programme this year, from the Dunk history exhibition we caught in Berlin, together with the accompanying retrospective book and a selection of Quickstrike releases, and it’s great to see people talking about the Dunk again. The Deep Burgundy/Metallic Gold release is available from Nike SB retailers now, including Slam City (Covent Garden Store), who were also kind enough to equip us with the above photograph.